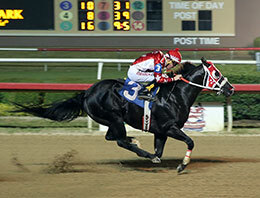 Paint My Pilot, under jockey Yordanis Amaro, winning the $213,200 Grade 3 Dash For Cash Derby at Lone Star Park. WYNNEWOOD, OK—NOVEMBER 9, 2018—Multiple Grade 3 stakes winner Paint My Pilot SI 105 has been retired from racing and enters stud under the management of Dunn Ranch near Wynnewood, Oklahoma in 2019. The son of leading sire Pyc Paint Your Wagon will stand for $2,500. 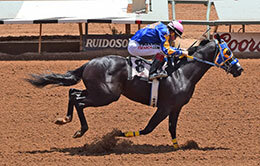 Racing for Double A Ranch, Inc. and trained by Jorge Gonzalez, Paint My Pilot won the 2018 Grade 3 Mr Jet Moore Handicap at Ruidoso Downs, defeating the likes of Grade 1 winners Bodacious Eagle and Apollitical Chad, etc. "We are very excited to offer this royally-bred runner to breeders in Oklahoma," Dunn Ranch owner Matt Dunn said this week. 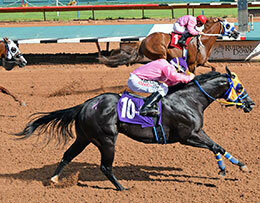 "Paint My Pilot competed and defeated the best of his age at Ruidoso, Remington Park, Lone Star Park and Evangeline, finishing in the money in 13 of 16 career starts." Paint My Pilot (outside) defeating Bodacious Dash in the 2018 Mr Jet Moore Handicap(G3) at Ruidoso Downs. Paint My Pilot compiled a (16) 6-4-3 record, earning $397,969 with wins in the Dash For Cash Derby(G3) and Mr Jet Moore Handicap(G3). He was second in the Rainbow Futurity(G1), Oklahoma Juvenile and third in the All American Gold Cup(G1), Dash For Cash Futurity(G1) and Bob Moore Handicap(G2) and was a finalist in the Corona Cartel Stakes at Ruidoso Downs and Evangeline Downs Derby. His sire, Grade 1 winner Pyc Paint Your Wagon SI 107 ($889,581), has sired 102 stakes winners, 1 champion, earners of more than $32.2 million including champion The Fiscal Cliff SI 109 ($580,425, AQHA Challenge Championship-G1), Remington Park Oklahoma-Bred Futurity winner Pyc Fun N Fancy SI 105 ($478,660 to 3, 2018), Champion of Champions(G1) winner Mr Pyc To You SI 97 ($478,045), etc. Paint My Pilot is out of the Grade 3 winner Ms Pilot Point SI 105 ($73,705), a "blue hen" producing daughter of champion Splash Bac. She is the dam of 17 ROM, 14 winners, 6 black type including All American Futurity(G1) winner and multiple stakes sire Mr Piloto SI 89 ($1,002,240), multiple Grade 3 winner Paint My Pilot SI 105 (see above), stakes winner Ms Leaving You SI 102 (4 wins to 4, 2018 $78,832), All American Derby(G1) placed Point Break Dash SI 99 ($413,127), stakes-placed Famous Joker SI 88 (winner to 3, 2018 $23,813), stakes-placed Dominicklala SI 90 ($16,610). She is also the dam of 2018 All American Futurity(G1) finalist Pilot Points Moon SI 102 (2 wins in 3 starts at 2, $129,480). The second dam is the On A High mare Dancing Tonight SI 91, dam of 16 ROM, 13 winners, seven black type including Grade 3 winner JLS Party Wagon SI 108 ($147,808), Grade 3 winner JLS Streak Of Snow SI 97 ($121,362), Grade 3 winner Ms Pilot Point (see above), etc. For additional information or breeding contracts call Matt Dunn or Shawn Lindsey, farm manager, at 580-279-6666.